Hi there! Welcome to another January Organizing Challenge. If you missed any of the spaces/areas we've already organized simply click the challenge tab at the top of my blog. 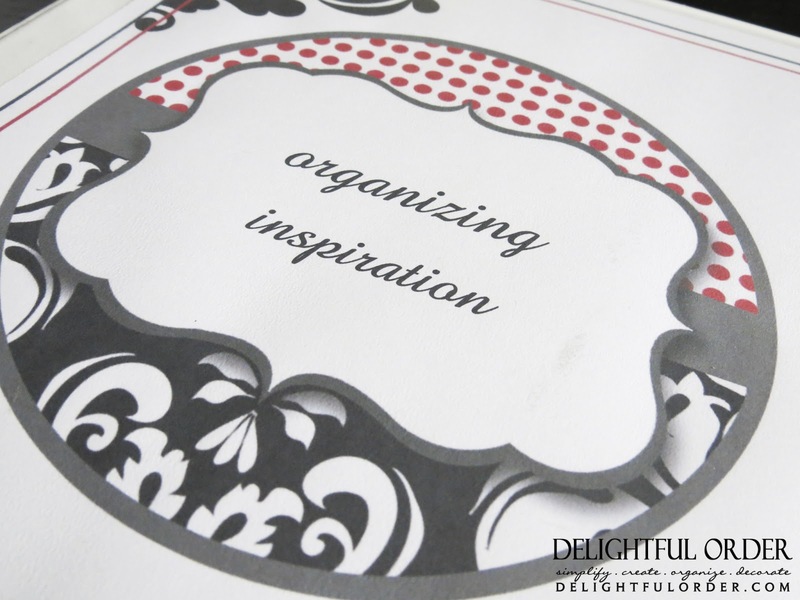 During the month of January we're organizing papers and today I'm showing you how I organize my inspiration. Now before I go into showing you how I organize the inspiration that I find in magazines and such, let me explain how I organize the inspiration that I find on the web. I'm sure that most of you have heard of Pinterest. If not, here's their words explaining what Pinterest is all about: "Pinterest lets you organize and share all the beautiful things you find on the web. People use pinboards to plan their weddings, decorate their homes, and organize their favorite recipes. Best of all, you can browse pinboards created by other people. Browsing pinboards is a fun way to discover new things and get inspiration from people who share your interests." Even though I do enjoy Pinterest, I find all kinds of inspiration through magazines and such. Below, I'll explain how I organize it all. This one is another semi-easy task. All you need is a few binders, sheet protectors and page dividers. 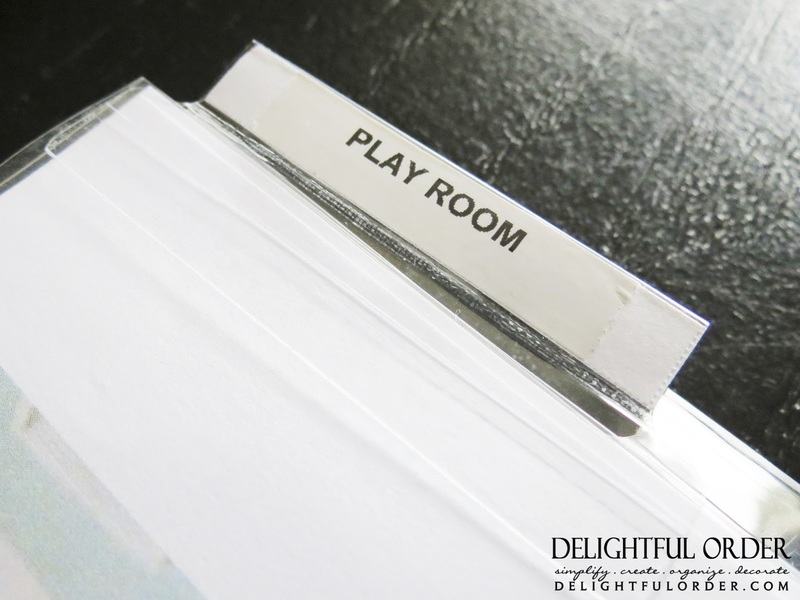 In the front of my binder I have a printable page that I created to keep track of some of my very favorite websites. 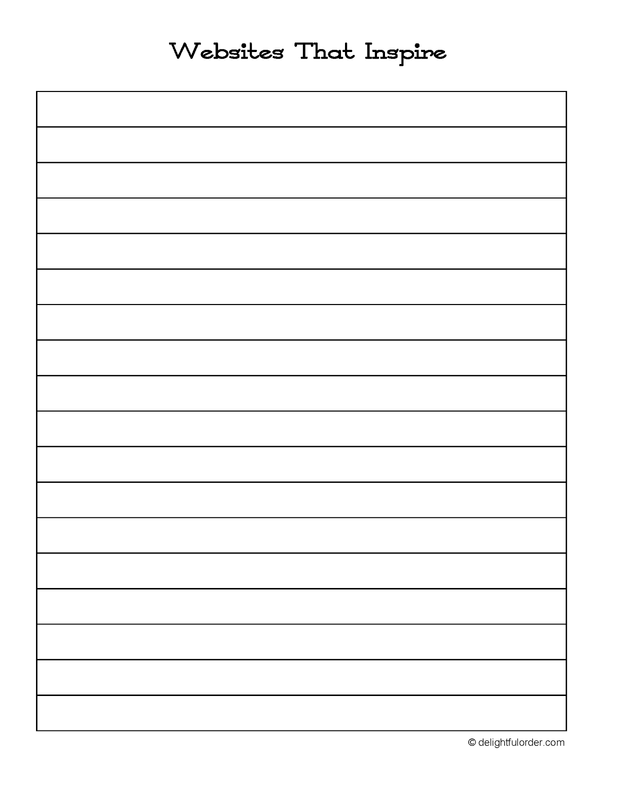 Which I created as a FREE PRINTABLE for you, my delightful readers. The very first binder I have is for any Decorating Inspiration that I find in magazines and such. I sort the inside of the binder with dividers by room. As I go through magazines, if there's something that catches my eye, I tear the page out, pop it into my 3 hole puncher (or I use clear sheet protectors) and insert into my binder. I keep very few magazines in my home. If I want to refer back to something that interests me, the pages will be here in my inspiration binders. I've created a separate binder for my organizing inspiration too. again this binder is sorted with dividers by room. This tear out is from a pottery barn magazine. I loved those buckets on the shelf and this page was my inspiration for my upstairs toy room. I've already shared part1, part2 and part3 on what I used to create a similar look, but at a fraction of the cost. 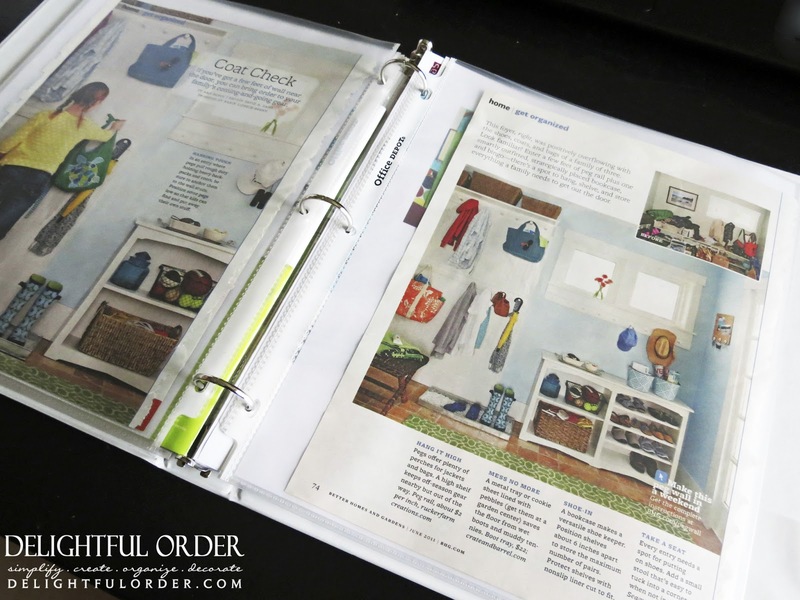 and here's a little more of the organizing inspirations manual. 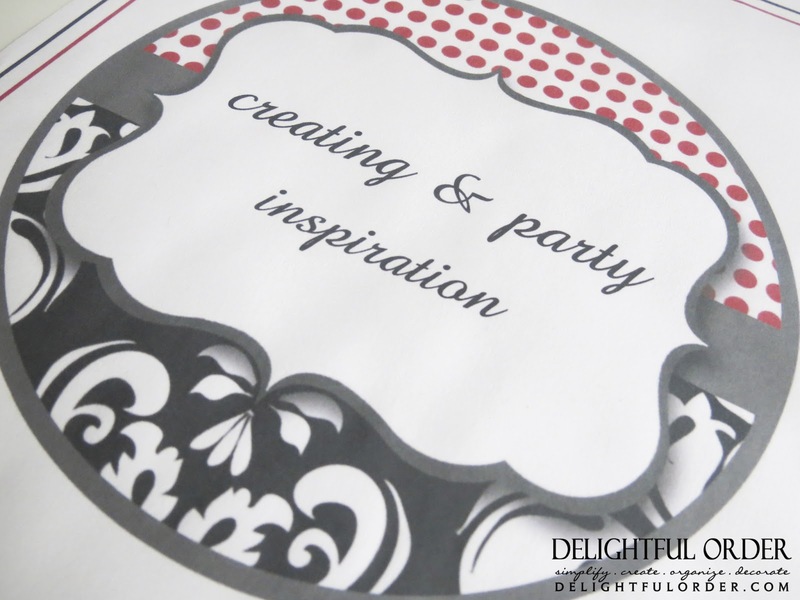 ... and sorted by inspirations that I would like to create, birthday party inspiration, baby or wedding shower ideas, scrap booking, card making ideas and other. I simply add the inspiration that I find inside each section. 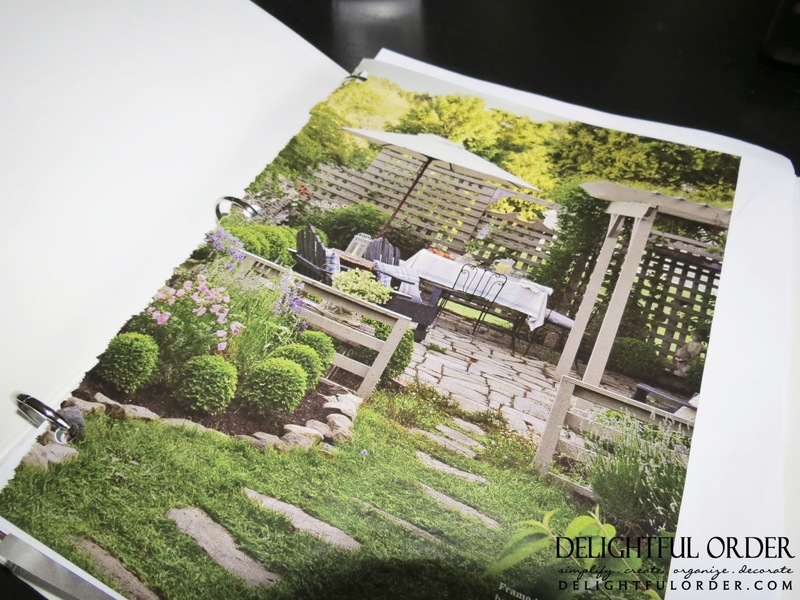 any outdoor & gardening inspiration that I find in magazines and such. 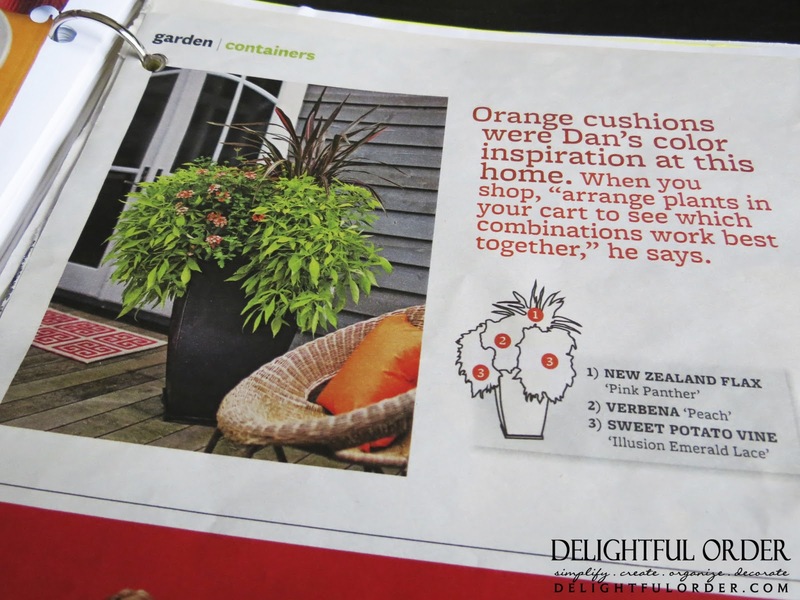 The Better Homes & Garden magazine that I read often has container ideas AND what I love so much is that they tell you what each plant is. 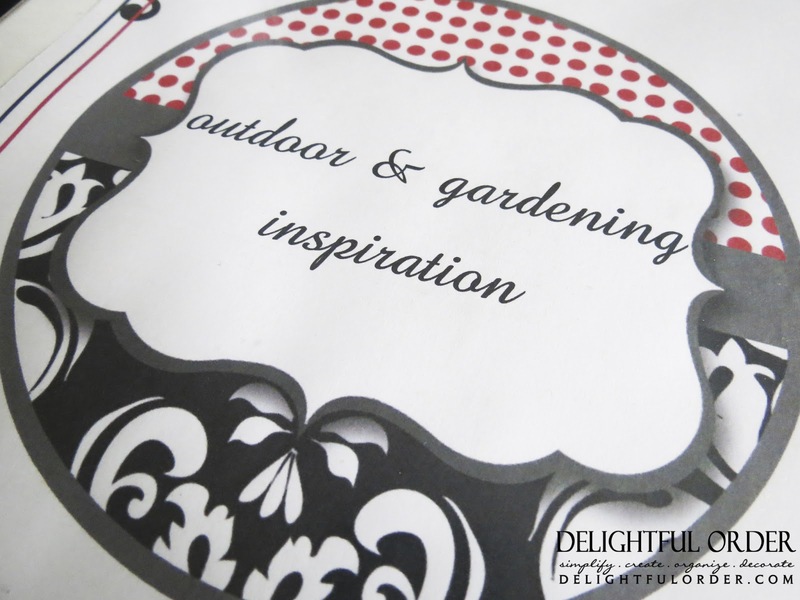 So... yep, you guessed it, I tear the page out and add it inside my outdoor & gardening binder. There you have it. That's how I organize my inspiration. Oh yeah and I almost forgot... I've talked about organizing my recipe inspirations HERE. Simply click the photo and print the PDF file. 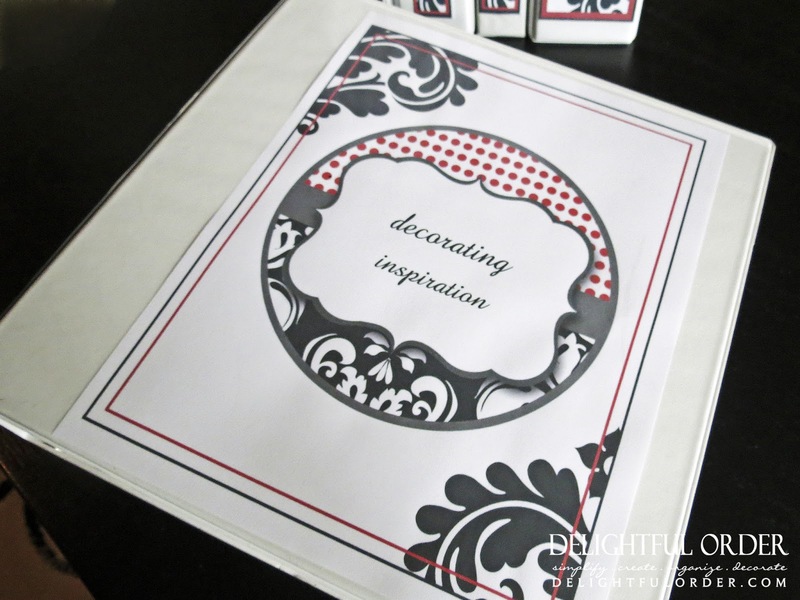 Remember all Delightful Order printables are for personal use only. 1. Get a few binders, dividers, sheet protectors and a 3 hole punch. 2. Decide how you will divide the binders. 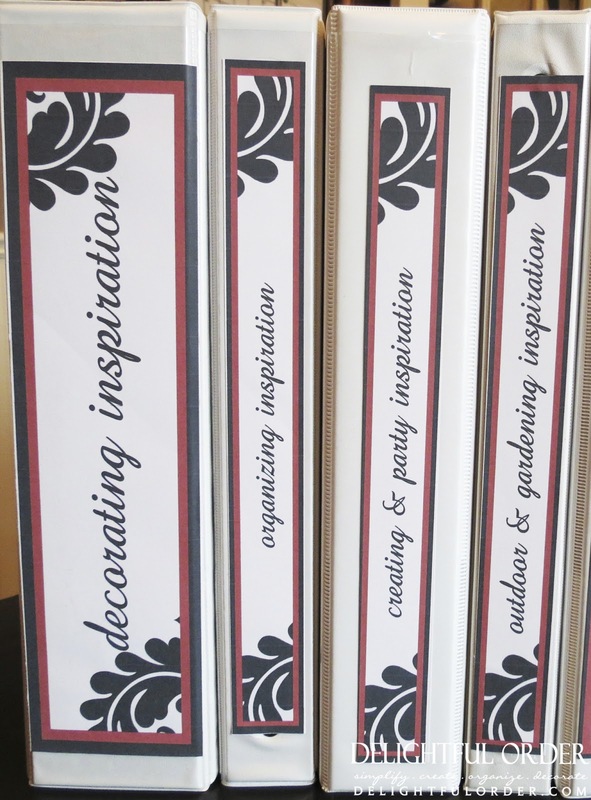 I gather a lot of inspiration, so I've created 5 different binders. 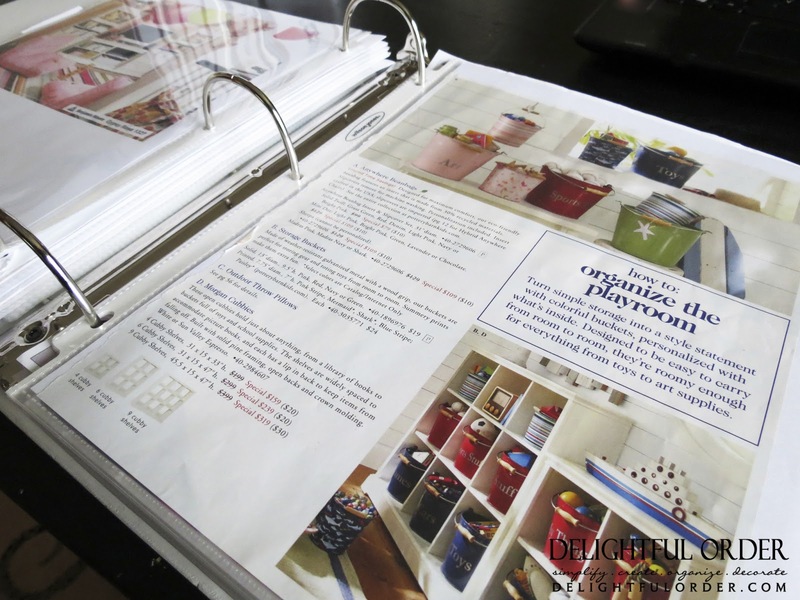 (Decorating, Organizing, Creating & Party, Outdoor & Gardening and Recipe Inspiration) Remember you can choose how many binders you'd like to use and how you want to sort them. 3. Gather all your magazines and whatever else inspires you and go through each one, tearing out pages and adding them to the proper binder. Once you've done this to each magazine you have, simply throw out or recycle that magazine. The other day, a reader asked me where I keep all the binders that I create, which is actually a great question. I keep all of these binders in my craft room/office closet on a tall bookcase. I'm not sure if you remember seeing that closet here on my blog before, but it no longer looks the way it did a few years back. Like I've said before, organization is a process and as my life/needs change, so does the organized spaces in my home. 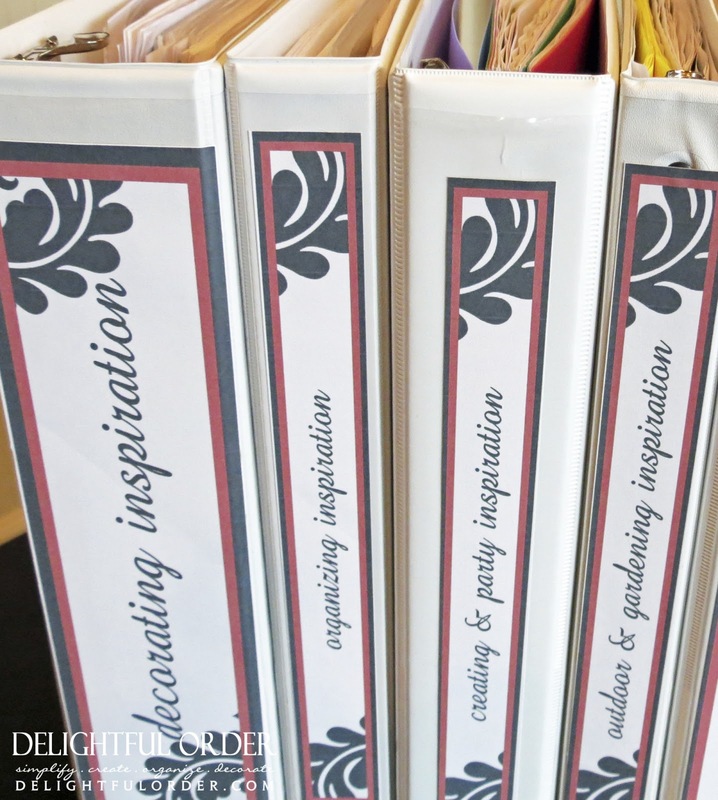 If you don't have a bookshelf or some certain space that would work for you to store the binders, you can organize your inspiration into file folders and place the folders into a file box or cabinet. What I share with you on how I organize my papers may not necessarily work for you in your home (you may not have the room to store lots of binders, etc.) It's simply just a way to (hopefully) inspire you to organize that area/space and make it work for you. I can't wait until the end of January to see how you're organizing that paper clutter in your home. Wanna join in on the Monthly Organization Challenge? During the month of January, we're Organizing Papers! 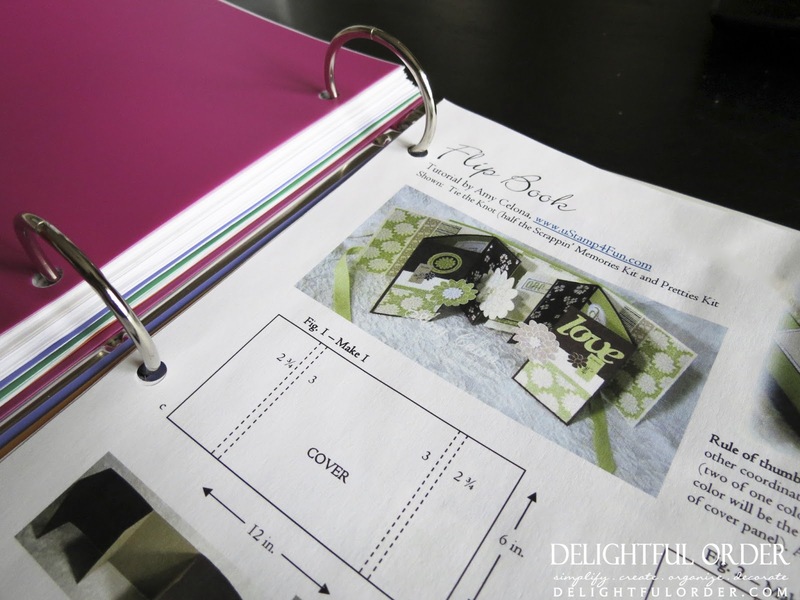 There will be a link party at the end of the month for you to share your Paper Organizing Posts. Join in, take photo's and blog about it. Then come back here at the end of January to inspire us all and share your paper organizing success. I was wondering if u have any suggestions for organizing my living room. I have alot of DVD s and no place for them where the baby can't get them. I love your organizational binders! 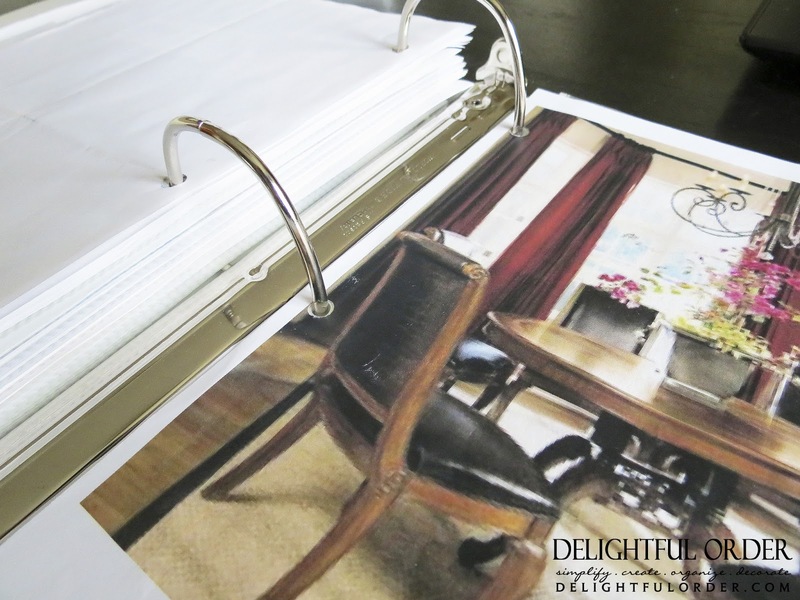 I LOVE binders and have used them for so many projects over the years! School, moving, household, recipes etc...Yours are so pretty DaNita! Thank you !! You are a great inspiration!!!! can't wait for the next blog!! !